One of Arianne's clients said: "My vet is amazing, treating birds, lizards, dogs and cats at the practice. In her spare time she treats the animals on her family’s farm; horses, chickens cows and sheep. 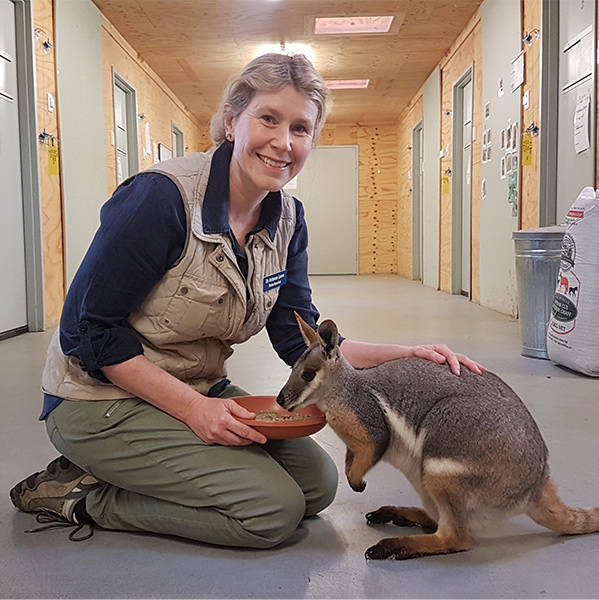 When she is not doing that she works at Tidbinbilla Reserve treating endangered wallabies, Corroboree frogs and Australian Wildlife." Ari has a passion for people and the animals who share this planet with us that is generous and infectious. She is a warm and wonderful communicator - knowledgable and professional - she would be a perfect BondiVet!!! Arianne has a natural way with animals and people. Her empathy and infectious positive attitude sets her apart from other veterinarians. She can link health, conservation and people's kinship with animals. At the same time, she can treat your horse, your backyard koala, and your outback frilled lizard. Vet Ari, holistic, honest, caring, and compassionate, making big differences to so many animal lives and their owners. Treating horses to sugar gliders, roosters, rabbits, cats, dogs, blue tongues, frogs and diamond pythons. She is a professional, confident and fun to be around. She would be a wonderful Bondi vet. Vet Arianne, effective communicator, fantastic diagnostician, empathic, caring and sensitive. She has cared for our fur and feather family for many years, through numerous and varied challenges. When she sees them, they greet her as their friend. Our animals love her, as do we. She is the best vet ever! If i was a pooch (or any animal) with an problem Ari would be the first vet I would turn to for help. Ari is caring sensitive and has a great passion for animals of all shapes and sizes. Our dog Harley loves to visit her.